Don't miss this great deal on an pre-owned 85' Pacific Mariner yacht for sale! 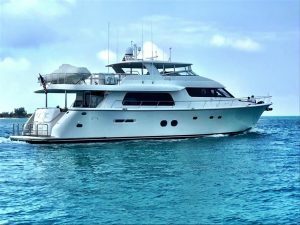 : Atlantic Yacht & Ship, Inc.
Chris Carroll has listed a deal on a beautiful pre-owned 85′ Pacific Mariner yacht for sale in Florida! In the first place, this pre-owned 85′ Pacific Mariner is known as “Lady C”. Conveniently located in Miami, Florida, she is easy to see. Overall she is a timeless beauty and highly efficient. In fact, she was built with a comfortable layout to serve as a great family vessel. After all she can accommodate up to eight guests overnight, plus crew. This is in four guest staterooms. Furthermore, she has a complete interior refit in 2016 so she is in extraordinary condition! On the whole, this beautiful pre-owned 85′ Pacific Mariner is turn key and ready to go. To sum up all the options she has we point out the full engine warranties. Moreover, with the zero-speed stabilizers you know she is fully-loaded. After all, this yacht was built at the Westport Yacht factory (hull # 21). She is powered with twin MTU 1,500 horse power diesel engines this yacht. They push her up to cruise at 22 knots! For more information on this beautiful pre-owned 85′ Pacific Mariner yacht for sale in Florida be sure to contact Chris Carroll today!